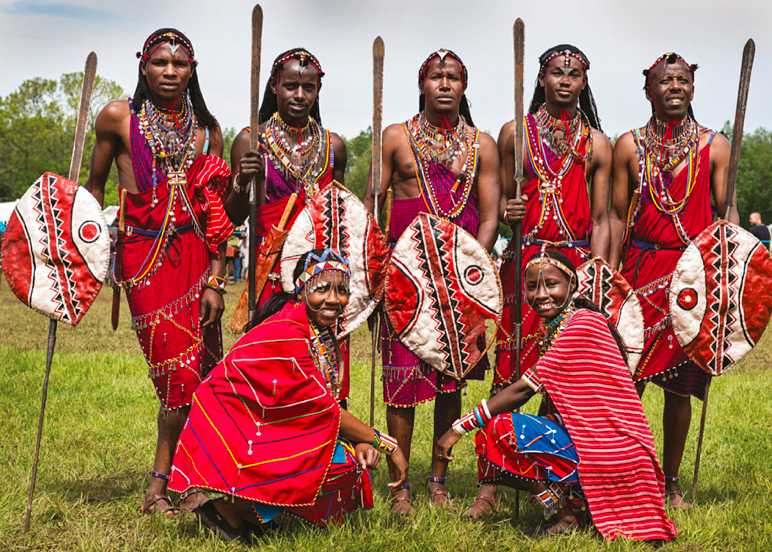 The Maasai tribe is a popular ethnic group inhabiting the African countries of Tanzania and Kenya. 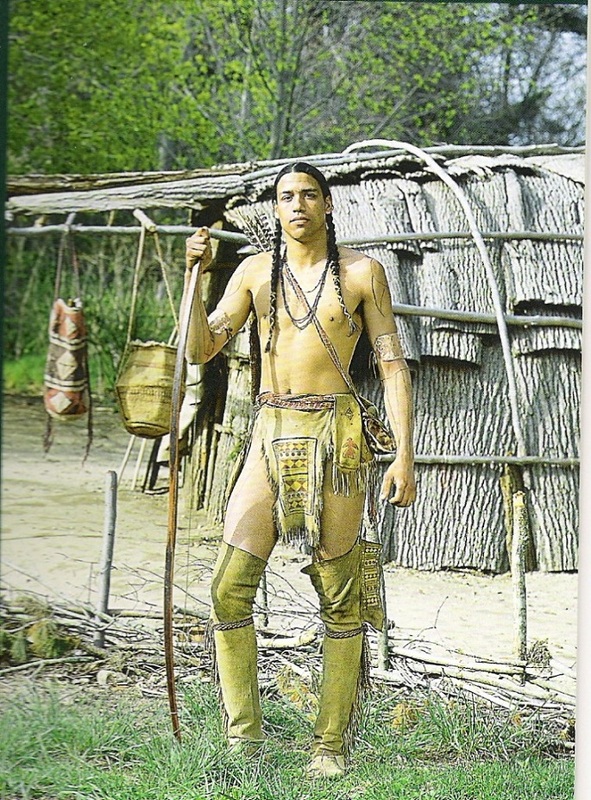 They have been a native of this region for a long time and their urge to retain their age-old traditions and semi-nomadic ways of life make them unique. 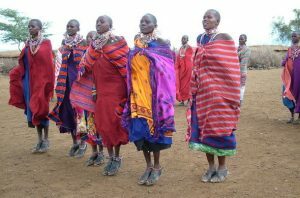 The Maasai tribe existed as early as the 15th century in the lower region of the Nile valley, located to the north of the Lake Turkana. These people initially proceeded to settle towards the northern part of Kenya, and between the 17th and 18th century, they occupied the Central Tanzanian belt. In this process, they forcibly displaced many other ethnic groups previously inhabiting the lands. However, some of the tribes, particularly the Southern Cushitic ethnic groups got merged into the Maasai. By the middle of the 19th century, their territories expanded significantly, covering a significant portion of the Great Rift Valley, as well as the surrounding lands in the regions of Mount Marsabit and Dodoma to the northern and southern part respectively. 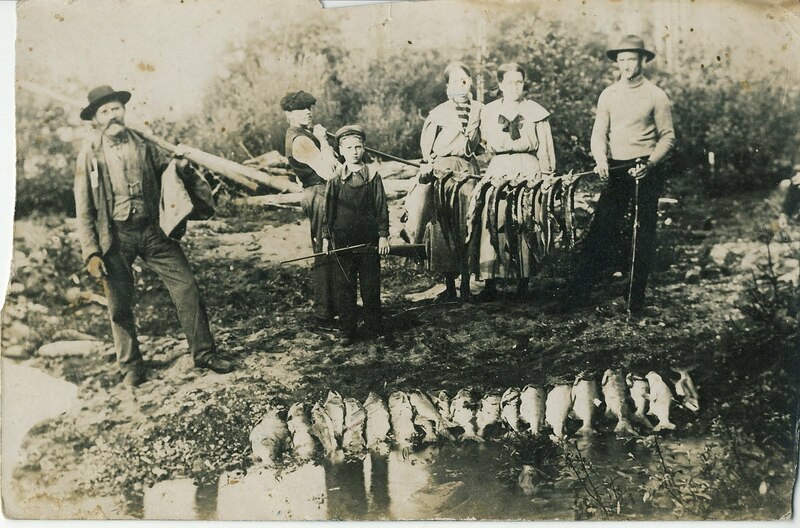 However, towards the end of the 19th and beginning of the 20th century, catastrophe struck this tribal group as epidemics of smallpox, rinderpest and contagious bovine pleuropneumonia killed approximately 90% of their cattle and over half of the wild animals. There was more to their suffering as a massive drought followed and lasted for a long time, killing many people of the tribe and also resulting in a steep dip in their population. Post this tragedy the British rulers, as well as the government of Kenya, seized over 60% of their lands to create national parks, wildlife reserved as well as ranches. Hence they were confined to the Narok and Kajiado districts which are also their present home. 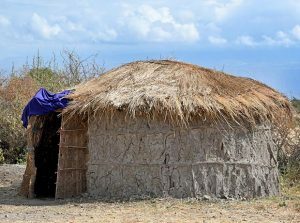 In the modern times, many of them are pastoralists and have also applied to Kenya and Tanzania to grant them grazing rights in the national parks (Nairobi National Park, Samburu National Reserve, Lake Nakuru National Park, Masai Mara) which were once their home. The Maasai people are known to speak in the Maa language, an Eastern Nilotic dialect. This corresponds to the Samburu (spoken by the Kenyan tribe Samburu), Parakuyu (the language of the Kwavi tribe) and Chamus (the language of the Ilchamus people), languages, all of which are variations of Maa. At present, however, their traditional language is gradually getting lost as Swahili and English is slowly taking over. 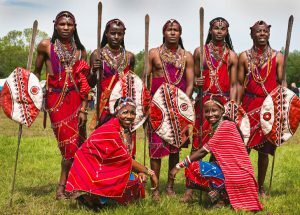 The Maasais are considered to be one of the world’s tallest tribe, with most of them being 6 ft. 3 inches in height on an average as per specific reports. Besides being pastoralists and herders, they were also great lion hunters in the past, considering it pride to slay the king of the jungle. Initially, they would hunt it singly, but due to the decline in the lion’s population, they encouraged group hunting. They did not eat the lion’s meat, but its mane, caws, and tail were used for various purpose. Hunting and preying of the lion at present has been banned in the African countries. The Maasais were wholly pastoral people in the past, and their cattle supplied all of their diets. Besides the raw milk and meat, they even drank the cattle’s fresh blood on special occasions as they believed that it helped in warming their body and providing strength. Not just the menfolk but also women and children are made to have it. This ritual exists even at present though in a milder manner as the blood is mixed with milk and given to the sick or consumed during special occasions. Their dietary pattern as however changed, mostly comprising of a maize meal and cow’s milk. While maize is eaten as a porridge known as ugali, the milk is had fresh or even added to sweet tea. Soups also form an essential part of their diet, the plant Acacia nilotica mostly used for the purpose. The stems and barks of this plant were either used as a decoction or added to their soups. Their food habits had perhaps made them healthy as electrocardiogram tests conducted on about 400 male Maasais deduced that they did not have any heart abnormalities or malfunction. A Canadian dentist, Dr. Weston A. Price, had been to the Maasai village in 1935 and stated how hardy these people were as most of them did not suffer from any dental or bone-related problems. 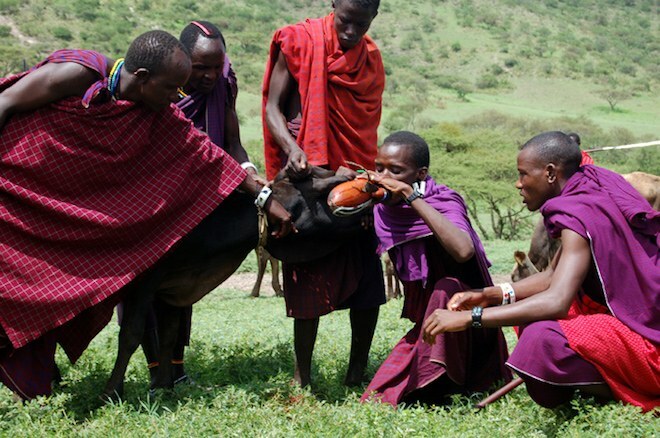 The cattle plays a significant role in the life of a Maasai as it not just provides them with their source of food but also serves as their status symbol. A man’s wealth is measured according to the cattle they possess and those owning about 50 of them are considered well off. They are extremely possessive about their cattle considering it to be the Almighty’s greatest gift. The cow’s blood which they drink, as mentioned above is extracted by shooting an arrow to puncture its jugular veins. The blood is then taken out after which the animal is nursed and tended to heal its wounds. They regard their cows alongside their children so highly that while greeting each other, they would first ask about the cows and kids than anything else. Livestock formed a major part of their economy, often traded for cash, other livestock or dairy products. 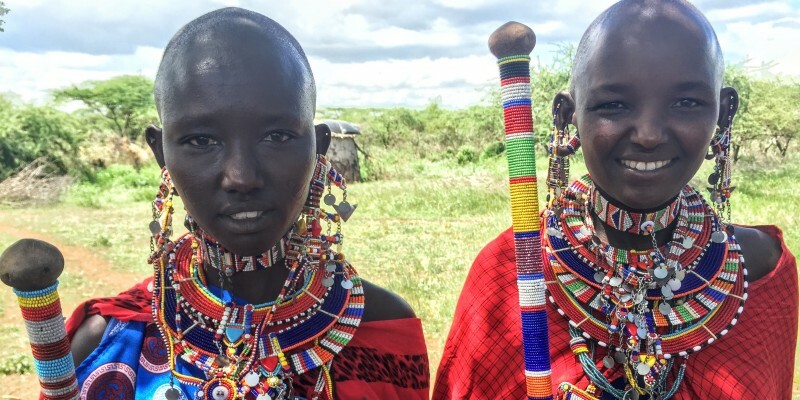 However, at present besides livestock and their products, the Maasais are also seen selling items made of beads, mobile phones as well as charcoal to earn their living. The Maasais were renowned for being fierce warriors, and the shield was one of their primary weapons used not just for fighting and hunting but also during training and practicing. They were made from the hides of buffalo and decorated using natural vegetable dyes. Others weapons used included arrows, spears, and rungu, which is a wooden club, not only used in wars but also signifying as a status symbol for the young warriors. These nomadic and semi-nomadic tribes mostly relied upon materials readily available from their surroundings to construct their homes. Traditionally their houses were impermanent structures since they mostly moved from one place to the other. 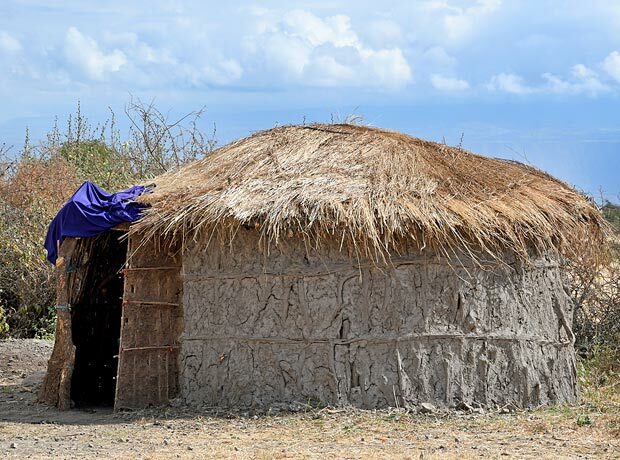 Their dwelling places known as engaji or enkaj, were small, circular huts made by women. Timber pole formed the structural framework, while sticks, mud, cow dung, ash, grass, and human urine were all used for plastering. It was in this domain that they cooked, ate, slept, entertained guests, accommodated smaller livestock as well as stored food and other belongings. Circular fences called enkang surrounded the villages and were constructed by the menfolk with the purpose of safeguarding their livestock from wild animals, especially at night. Their clothing patterns are really interesting as it changes in accordance to age as well as occasions. 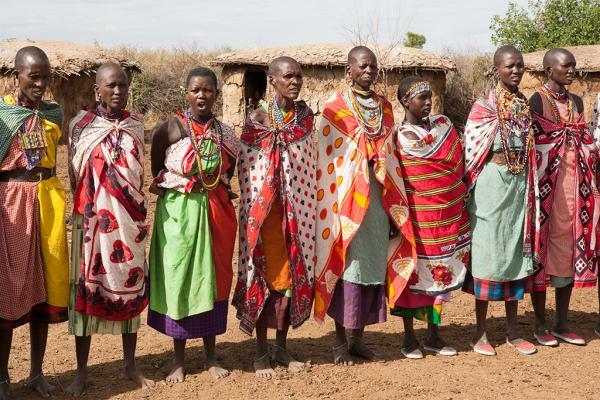 Black is mostly worn by young men and women after circumcision. Red is the most desired color of the Maasais as they feel the vibrance and energy of this shade defines their culture the best. Red clothes even served the purpose of scaring away lions. 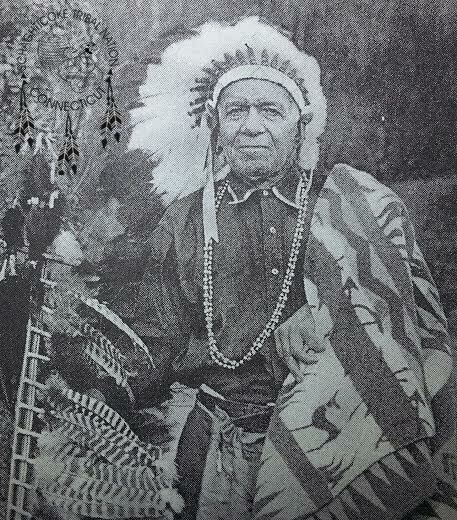 Initially, their attire consisted of calf hides and sheep skin, which was later replaced by the cotton cloth. 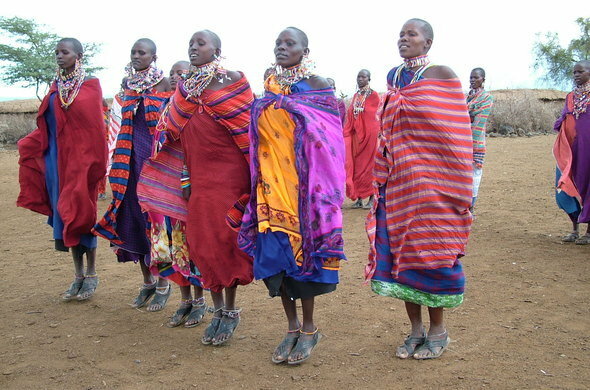 Shuka or sheets are mostly used by men and women to wrap around their body. Though red is the preferred color, blue, black and even pink with checkered or plaid patterns are even preferred. 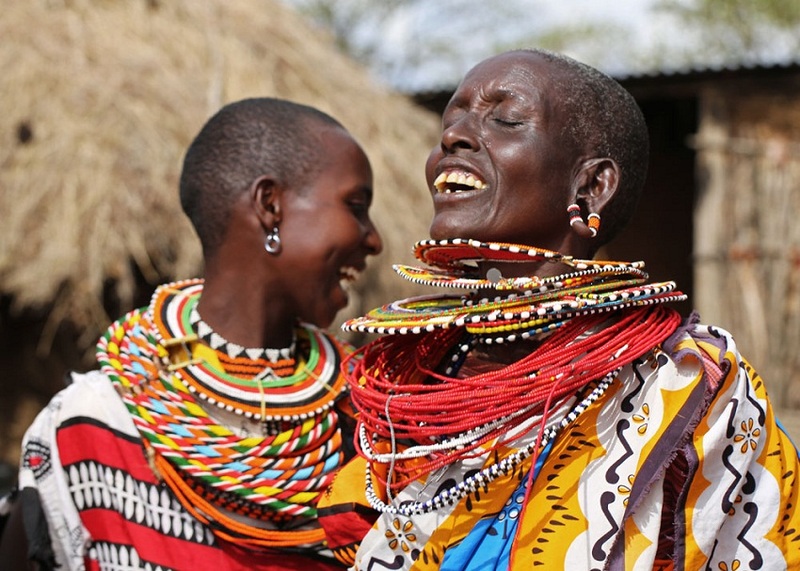 Beaded jewelry plays a significant role and both men and women wear them. While the men adorned their wrists ankles, necks and waists with beaded bands, women wore big collars made of beads and even decorated their ears and earlobes with it. Each color of the beads has a special symbolism as red stand for chivalry and strength, blue means the rain and sky, white is peace, as well as the color of their cow’s milk, green means fertility, plants, and abundance, yellow and orange, refers to hospitality while black indicates the hospitality of people. Before Europeans had extended their influence on the tribe, they made these beads using raw materials, shells, clay, bones, and ivory went into the making of white beads; charcoal, clay, horn, seeds, and iron were used for the black and blue ones, while the red beads were prepared with woods, bone, brass, copper, seeds, and gourds. Their art and craft mostly consist of beadwork which is embossed in clothes as well as made into jewelries. 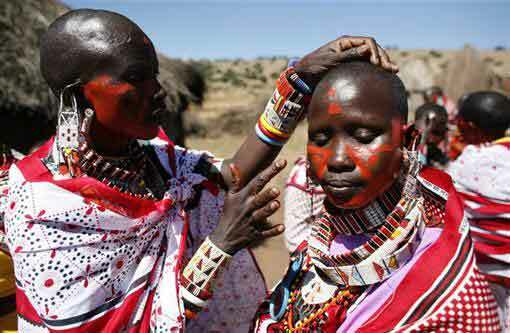 Boys – Maasai is a patriarchal society where most of the important duties are in the hands of males. After they surpass the infant and toddler phase, young boys are assigned with the task of tending the lambs and calves, particularly when they are taken out. When they are above the age of 12, the boys are taken for circumcision without anesthesia. They ought to endure the pain to maintain the honor and dignity of their family. This process is mostly done by the elders, and the healing process can be between four and eight months during which it is a mandate for them to be clad in black clothes. Post this, they go through a series of ceremonies and can transcend to the level of a warrior. Girls: Females are mostly inclined towards doing household chores like cooking, cleaning their homes, and doing beadwork. Young girls, on reaching the age of 14 had to go through circumcision also, without which they were not regarded to be a prospective bride. Just like the males, females too after circumcision had to put on dark-colored clothes, as well as veil their face. 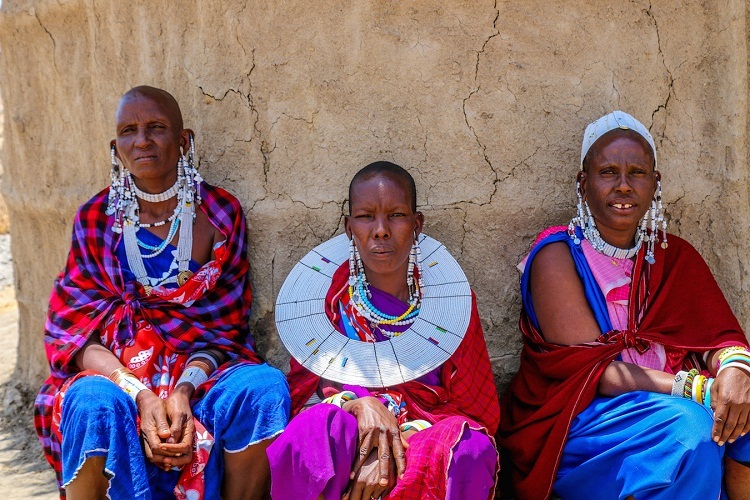 Polygamy and polyandry was present in the Maasai society and is still practiced at present, also considered as legal. In the past, a woman could enter into a relationship with any visiting male if she consented to do so and any child produced during such association would be the heir of her husband. However, this particular practice is shunned at present. The notion of divorce or kitala existed even then, where a woman could go back to her paternal house under the pretext of ill treatment, while the compensation and child custody is mutually decided upon. At one point in time, the rate of infant mortality was extremely high in these tribes, one reason being that pregnant women ate less with the desire to produce babies of a smaller size. Moreover, they also lived under unhygienic conditions without proper facilities. However. their condition appears to be better at present as women are being educated about the needs of going to clinics and hospitals during pregnancy. This is another important ritual, with both men and women shaving their heads on numerous occasions. Once the child is 3 years old his/, her full head is shaved except for a little hair left from the nape to the head. Boys also have their heads shaved two days prior to the circumcision to be taken place. Only the warriors are permitted to grow their hair which is often plaited as well as parted into two halves. However, after transitioning to elders post a ceremony, their entire head is shaved. Girls also have their head shaved when they are to get married and two rams are also sacrificed for this auspicious occasion. Their music is rhythmic and harmonious where the olaranyani or main singer leads the song, followed by the rest. Women are known to engage in humming lullabies or singing in praise of their sons. Young men and women are often engaged in a song while flirting with one another that also involves a certain amount of body movement. Alongside song, the dances of the Maasais are also equally popular especially during the eunoto ceremony (when a young warrior goes into senior warrior hood). The jump dance is common where the warriors form a circle and one or two of them jump within without their heels touching the ground. They even raise their voices based on how high they are jumping. Inheritance is of utmost importance in the Maasai family over which only the male members have a right while the females could enjoy the ownership of their father’s property till the time she is married. When a man is ailing and is about to die all his sons should return and his property, as well as debts, would be distributed among them. In case of a sudden demise, the property and debts are transferred to the eldest son of the family, whose duty lies in dividing them among his brothers. If a man has only daughters then in such cases one of them should not get married but could enter into a relationship with a man of her choice in her father’s home. If this association leads to the birth of a son, then the latter would have possession over his grandfather’s property. Maasais practiced monotheism as they believed in a single god, calling him or her Ngai as the gender is not confirmed. However, Ngai was said to be in two forms, the black, which stands for good and docile and red that means angry. Presently most of the members of this tribe practice Christianity while some of them have also taken to Islam. They did not practice the notion of an afterlife and according to them, death brings an end to a man’s eventful life. Hence there would be no burial but the body would be thrown into the forest to be preyed upon by animals. Sometimes it would also be smeared with the blood of ox or cattle for the purpose of attracting the prey. In fact, when a person died in their home, all other members would vacate the dwelling place at once while an unknown person unrelated to the family would carry out the remaining process as mentioned above. The government has made a lot of attempts to bring the Maasais into the modern stream of life. In fact, in 1975 a ban was put on cultivation practices to divert their attention to other matters. They were compelled to trade with the traditional medicines they made as well as their animals to get food and other amenities for survival. However, they once again got an opportunity to shift to cultivation when the ban had been lifted in the year 1992. However, they had to shift to other means of survival since grazing was gradually being limited and even restricted due to the demarcation of parks and privatization of lands. A lot of projects and programs have developed over the years to help the tribe to retain their traditional forms of life and at the same time be enlightened with the modern ways of life and give their children the needed education. At present, besides farming, this community has also been engaged in a host of jobs in the private and public sectors. Some of the notable Maasais who have made a mark for themselves and their tribe are Edward Lowassa (Tanzanian prime minister between 2005 and 2008), William Ole Ntimama (political leader of Kenya as well as the Maasai community), and David Rudisha (popular athlete).